Our galaxy is being devoured by a dark force - Super Mech. Only you and the power of the ultimate weapon, "HELLFIRE", can save us! But the blinding firepower alone can't save you, you'll need to utilize four weapons with strategy and great prowess! Super Mech is out to eliminate you! Can you save the galaxy? 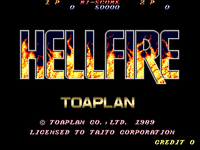 Awsome features include 4 Mbit ROM, 6 levels, Continue, Selectable Firing direction, multiple endings and 16 bit graphics.